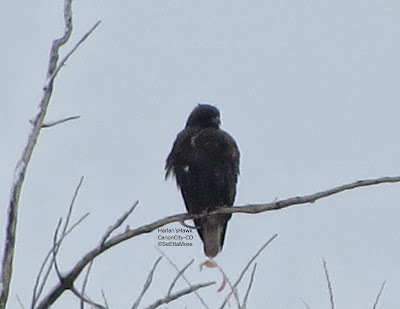 Yesterday I found two dark morph Harlan's Hawks on private property in Canon City. 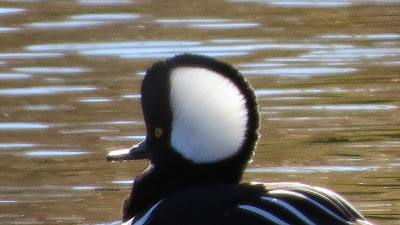 Both were more than 300 feet away so have cropped the photos tightly just to get these views. The top two photos are of one Harlan's that has a small amount of white streaking on it's breast. As shown on the tree limbs, we had about 2 inches of snow at that point. Greater Spreadwinged Damselfly (Archilestes grandis). 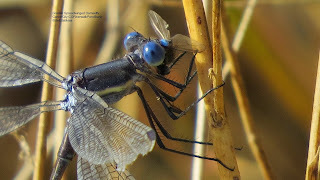 After I found the Western Pygmy-Blue butterfly on November 21 I went looking near a pond on the Canon City Riverwalk for odonata and found two Greater Spreadwinged Damselflies (Archilestes grandis)-the one in the top two photos and a different damselfly at the bottom (see the difference in the ragged wings). I didn't see until I cropped the top photo that this damselfly is munching on another winged insect! 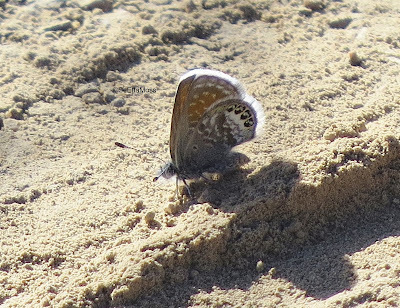 Yesterday I found this Western Pygmy-Blue, a very small butterfly that is listed as having a wing span of only 1/2 to 3/4 inches--and it was very tiny and flighty so hard to photograph. Interestingly I found a record of this species photographed on October 17, 2011 in my county on the ButterfliesAndMoths.org website. It had this note from the person who verified the sighting: "Not uncommonly found in the Arkansas R. valley in late summer and early fall." 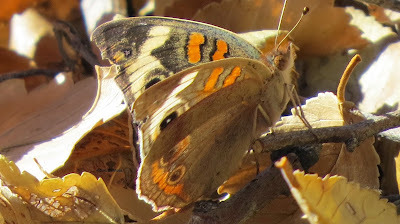 Two days ago I found this Buckeye butterfly in a location that was sheltered; however, there were not any flowers there but there were a number of clumps of rabbitbrush with a few flower blossoms on them a hundred + feet away. 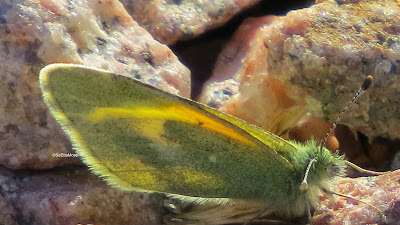 I was quite surprised day before yesterday to spot a small yellow butterfly in my yard--though we have had pretty warm temperatures in Canon City this fall, the temps have fallen well below freezing on a number of occasions which has stopped flowering of most plants so not much for butterfly to nectar on. It was quite small, with a wingspan of about an inch. Follow-up 11-17-13-BugGuide.org confirmed this as a Dainty sulfur butterfly.